I simply can’t wait a year for the Canadian dollar to get back up to 80 US cents. So please pray (for me, and only me) that the Bank of Canada takes a loonie-friendly approach when it announces its rate decision, releases its monetary policy report and chats with reporters Wednesday morning. The difference between the loonie at 80 US cents and the loonie at 76 US cents, which is about its recent level, represents thousands of dollars when you add up tuition, housing and all those student things. The problem is that forecasts don’t put the Canadian dollar at 80 for quite some time yet. Worse still, the currency would erode even further should President Donald Trump and his administration make good on the threat to hit auto imports with 25-per-cent tariffs. 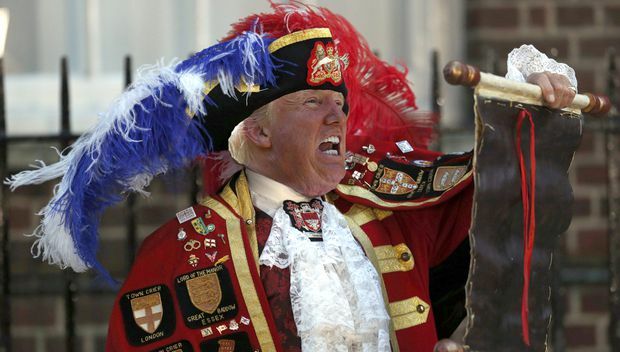 Or should talks to renegotiate the North American free-trade agreement fail. Weighty issues when you need to study hard and - not my baby, but presumably others - party at least a little bit at the graduate level. There are obvious benefits to a lower loonie, particularly for Canadian exporters. But they don’t benefit Molly and me directly, beyond what they mean for the broader economy. Which I guess benefits me, but you get my here-and-now point. At least some American schools will use current exchange rates to calculate whether you’ve got enough money to get you through a year. But they presumably won’t factor in that JPMorgan Chase, for example, sees the loonie at almost 79 US cents by December, just shy of 79.5 by next March, and 80 by mid-2019. Also at play are the different monetary policies in Canada and the U.S. Both the Bank of Canada and the Federal Reserve may be in the midst of a rate-hiking cycle, still moving back to normal a full decade after the financial crisis, but their timelines are different. Higher interest rates and signals of such moves make the Canadian dollar more attractive. Which is why the loonie can move up or down, sometimes sharply, on economic indicators and comments from Bank of Canada officials. Which makes Wednesday an interesting day for my Molly. That’s when economists and markets expect governor Stephen Poloz, senior deputy Carolyn Wilkins and their colleagues to raise their benchmark overnight rate by one-quarter of a percentage point, and then wait and watch while the global trade war, key to Canada’s fortunes, plays out. “Though Trump has said he expects nothing to be done on NAFTA until after the midterms, talks will be ongoing and headline risk remains high,” RBC strategists said in their outlook. “But we think USD/CAD is already carrying a decent-sized trade-tension premium, and the U.S. would have to step up its actions to drive USD/CAD higher (e.g., by imposing tariffs on Canada’s autos),” they added. They were referring to the U.S. dollar versus the loonie by their symbols. And by higher, they meant a lower loonie. Said “northern neighbour” includes Molly. Syncrude Canada Ltd. will not restore full production at its 350,000-barrels-per-day oil sands mine until early to mid-September, keeping pressure on North American oil prices through the summer, The Globe and Mail’s Shawn McCarthy reports. Suncor Energy Inc., Syncrude’s majority owner, said it would begin some production later this month after a site-wide power outage shut down operations on June 20. The company will start up one coker, which processes 150,000 barrels per day bitumen into a lighter crude, in the second half of July, Suncor said. Production at a second coker will begin in in the first half of August, bringing total output to 250,000 barrels per day. The Bank of Canada is widely expected to raise interest rates this week. And despite my selfish plea, there are questions of whether it do it just now. 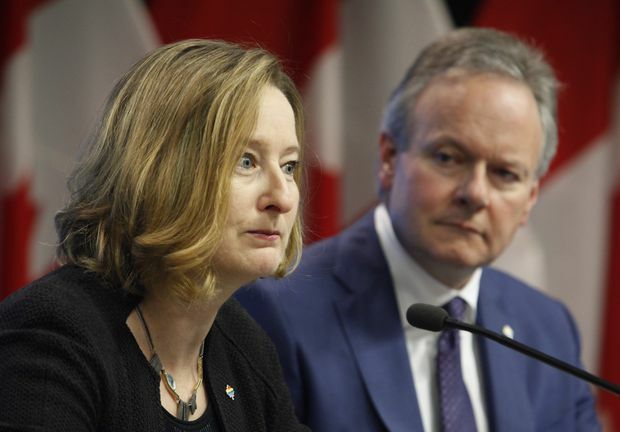 Economists say there’s more than enough justification for governor Stephen Poloz, senior deputy Carolyn Wilkins and their colleagues to raise their benchmark overnight rate by one-quarter of a percentage point to 1.5 per cent Wednesday. But at the same time, Canada is embroiled in a trade war with the U.S. that threatens to escalate. The latest economic readings seem generally solid but hardly exceptional. The household debt picture is improving but still troubling. We’re still adjusting to earlier rate hikes and new mortgage-qualification rules. And inflation, though above the central bank’s target, isn’t out of hand. That’s a lot for central bankers to juggle in this new era of uncertainty, as the Trump administration changes the rules of the game with import tariffs that have sparked retaliation by several trading partners, including Canada. Key will be whether the Trump administration follows through with its threat to punish auto imports, which would hit Canada, and Ontario in particular, hard, possibly driving the country into a recession. Thus, the Bank of Canada could find itself in the position of having to cut rates down the road. Mr. Poloz and Ms. Wilkins won’t be held hostage by trade-related headlines and comments, but they’re obviously concerned about how this conflict plays out. “The uncertainty entering this trade war leaves the Bank of Canada in a bind when it decides on interest rates Wednesday,” said economist Paul Matsiras of Moody’s Analytics, sister company to the credit-rating agency. Mr. Matsiras expects the central bank to hold rates steady this week, but many others believe it will act. The market thinks so, too. “Leaving aside the trade rhetoric/uncertainty for a moment, the Canadian economic backdrop is fully consistent with higher policy rates,” said Benjamin Reitzes, the Bank of Montreal’s Canadian rates and macro strategist. The latest Ivey purchasing managers index (PMI) – a measure of the manufacturing sector – was still in positive territory, but declined markedly in May from April. The Bank of Canada’s last business outlook survey, which helps guide its decisions, may have been strong, but the parts of the survey that signal expected sales growth and capital spending both declined. Not only that, other analysts noted that most of the survey was done beforethe United States hit Canada with tariffs on steel and aluminum. The central bank will also release its monetary policy report this week, which could include tweaks to its economic forecast. “We could see another trade uncertainty-driven downgrade in this [monetary policy report],” BMO’s Mr. Reitzes said, but added the change would be marginal. We’ll see how markets open after last week’s gains despite global trade fears. The S&P 500 gained 1.5 per cent last week, pushed higher by stocks in the health care, utilities and tech sectors, BMO senior economist Robert Kavcic noted. “The index is now up 3.2 per cent on the year, with small-caps outperforming the big guys by an 11-per-cent to 3-per-cent margin,” Mr. Kavcic said. “Meantime, the TSX added 0.6 per cent, with strength confined to relatively lightweight sectors – banks and energy were modestly higher on the week,” he added. In the corporate sphere, Alimentation Couche-Tard Inc. reports quarterly results. Economists expect Canada Mortgage and Housing Corp. to report residential construction starts rose more than 7 per cent in June to an annual rate of 210,000 or better, and for Statistics Canada to report a 4-per-cent rise in building permits. Royal Bank of Canada economists forecast that housing starts could show a rise of almost 10 per cent to 215,000, following a plunge in May. “With the most recent permits data through April remaining strong at 227,000, on a three-month moving average basis, our expectation is that the May weakness will not persist with new construction bouncing back in June,” RBC said. PepsiCo Inc. also reports results. Besides the Bank of Canada, its former chief Mark Carney, now Governor of the Bank of England, speaks at a Boston conference. There are several quarterly earnings reports, too, including those from Aphria Inc. There are some things worth watching, such as industrial production numbers from Europe and a meeting of euro zone finance ministers, but the biggie is the U.S. inflation report. Economists generally expect to see a rise in June to an annual rate of 2.9 or 3 per cent. “U.S. inflation has been heating up this year, owing partly to a run-up in energy prices recently,” CIBC World Markets’ Katherine Judge said. Key for markets will be what the report suggests about the U.S. Federal Reserve’s rate-hiking cycle. The Fed gives its monetary policy report to Congress, while U.S. bank earnings kick off with JPMorgan Chase & Co., PNC Financial Services Group Inc. and Wells Fargo & Co.